XOLO has launched their latest smartphone, the XOLO ONE HD. The new XOLO ONE HD featuring 5inch 720 x 1280 pixels IPS LCD display is priced under INR 5K. It draws the power from 1.3GHz Quad-core processor integrated with 1GB of RAM. The ONE HD is equipped with 8MP main camera and 5 MP selfie taker. It gets the juice from 2300-mAh battery offering 9 hours talktime. It is attained with 8 gigs of internal storage and runs on Android 5.1 Lollipop. It is a DUAL SIM smartphone with 3G connectivity. There is Mali-400MP2 GPU and it is 9.5mm thick.It will compete with Moto E2, Micromax Canvas Spark, YU Yunique, MMX Canvas Xpress 2, Coolpad Dazen 1 and ZTE QLUX 4G. 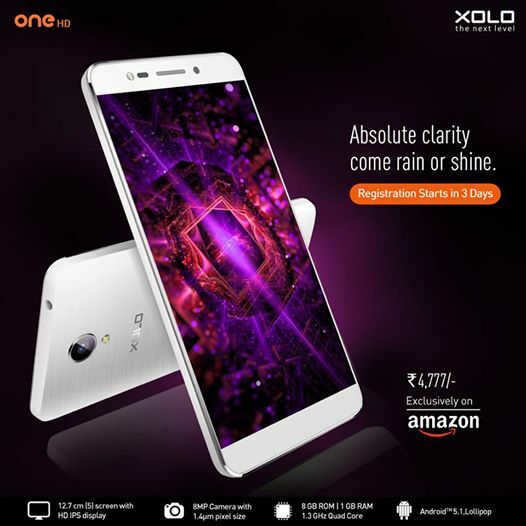 The XOLO ONE HD is priced at RS 4777. It will be available in Black, White colors. It will be exclusively available from Amazon through flash sales, registration will begin in 2 days.